Hang on to your chair and prepare to have your mind blown. That water in the glass bottle on your desk is old, and I mean unfathomably ancient – even older than the Sun, according to new research. Motherboard reports that scientists have known for some time that the water on Earth is really old, but new research recently published in the journal Science shows that it’s even older than previously thought, and actually predates the formation of our solar system. The news increases the chances that water is present on other planets, along with other forms of life. Ilsedore Cleeves and a group of space researchers at the University of Michigan made the discovery by using a detailed computer simulation of the early solar system based on observations of other young Sun-like star systems that are currently forming. “By studying these astrophysical objects using high power telescopes and numerical techniques, we can use this information to model the protoplanetary disk environment in great detail,” Cleeves told Motherboard. The details of the observations get pretty technical, but basically the scientists looked at the formation of ‘heavy water’ interstellar ice that contains deuterium, a hydrogen isotope in the place of a normal hydrogen atom. 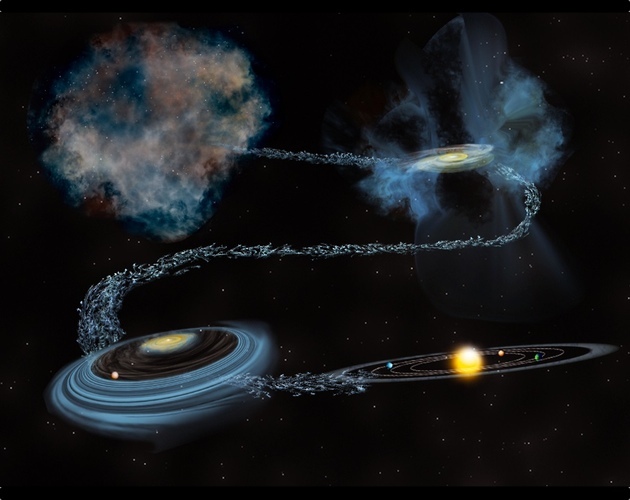 Heavy water forms at temperatures just above absolute zero and was present in large amounts during the birth of the solar system based on samples from that period. Since the Earth’s ocean, meteorites and comets all show high levels of heavy water to regular light water, Cleeves was able to simulate how much heavy water would be expected to form within a developing solar system. The question posed was whether the high deuterium levels found in the samples were inherited from the pre-existing interstellar gas cloud, or if it was created by chemical reactions in the formation process. To make a long story short, that means much of the water on Earth is older than the planet and its solar system, which could mean that water might be “seeded” into solar systems across the universe along with other essential organic compounds. This boosts the possibility that there are other habitable planets out there waiting to be discovered. Some exciting headlines coming your way with the potential implications of this study, http://www.pressreader.com/profile/Media_Mentions/earth's_water but let’s remember that that’s all it is at this point: one modular study. An illustration of how the solar system formed. Our water is older than the Earth and even the sun.